With my dark circles, concealer sticks are what I normally go for because of the high coverage. 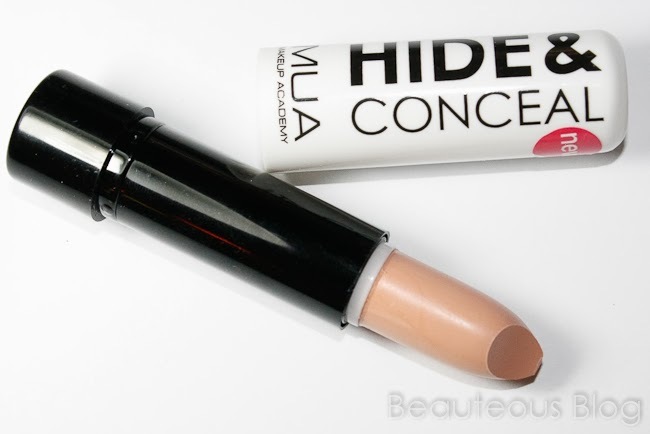 I picked up MUA's new High & Conceal Stick just to see if I was missing out on a good product. So was it worth it? "A NEW Formula... our NEW Hide and Conceal Sticks in three colours- Fair,Natural and Almond. A creamy, easy to use new and improved formula to cover any blemishes or skin imperfections." I picked this up in the shade Almond since it was the most peachiest shade out of the range. I have pretty prominent dark circles and since I wear glasses the dark shadows are more visible so it's highly crucial for me to conceal. 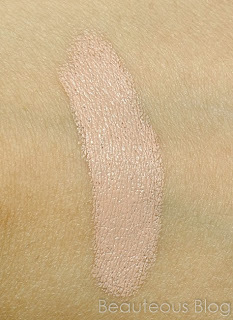 Almond is a very pale peach shade. It has a very creamy, emollient texture, it's not at all stiff or hard. If you suffer from dry eyes, this will work really well to combat any dry areas. It blends into the skin really easily but does need to be layered on a few times for medium coverage but will begin to crease if applied too much. Since the texture is very creamy, the concealer slips and slides all over the place if not set with a good mattifying pressed powder. It will crease after about 4-5 hours even after setting it with a powder, it will settle into any and all fine lines that you may have. If you have very dark, purple tone undereyes this will leave a grey cast since it's not that peachy. I don't reach for this concealer often to hide my dark circles but instead I use it to highlight right above my cheek bones, I love the effect it gives with my foundation. If you're looking for a cream product to use along with your concealer to help it brighten, this will work really well. I have recently added.concealer in my stash, I like liquid ones as *touchwood* no dark circles, just to complete the look of.makeup. Hi Sidrah. Which press powder you used with this concealer?